This is the most unique way of saying thank you to your friends and family. Yellow is a colour of appreciation. This wonderful hamper of yellow roses will easily deliver your feeling to your special someone that you can’t say by words. So, this Father’s Day or Mother’s Day lets appreciate our Parent’s effort & say thank-you in the most special way. Just click a button and order this amazing hamper and we will get it delivered in Jaipur at your doorsteps. 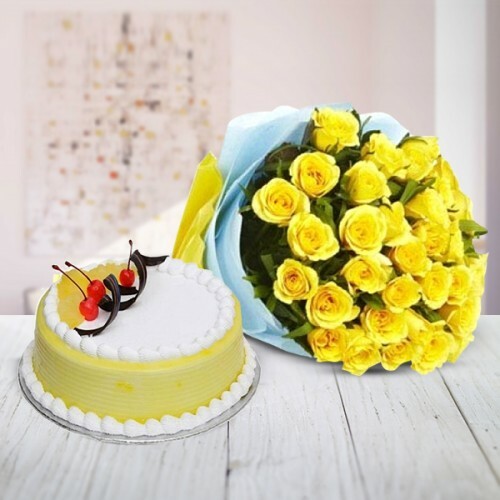 Items: Yellow roses and half Kg Designer Pineapple cake. Type of Bouquet:20 Yellow roses wrapped in blue paper with yellow ribbon over it. Cake: Half Kg Pineapple designer cake. Let’s say thank you in the most special way and appreciate our Parent’s efforts. Can gift to your friends as the token of all the best.